U.S. Prison Population in 2008. Louisiana has the highest incarceration rate. The number of faces behind bars is increasing everywhere on the globe. Due to the collapsing penal system in the USA, the government is forced to enact laws that provide for the early release of elder, non-violent offenders. Yet, those released individuals remain on probation and, therefore, in the system. The higher the prison population rate (per 100,000 of national population), the more likely innocent inmates are confined. 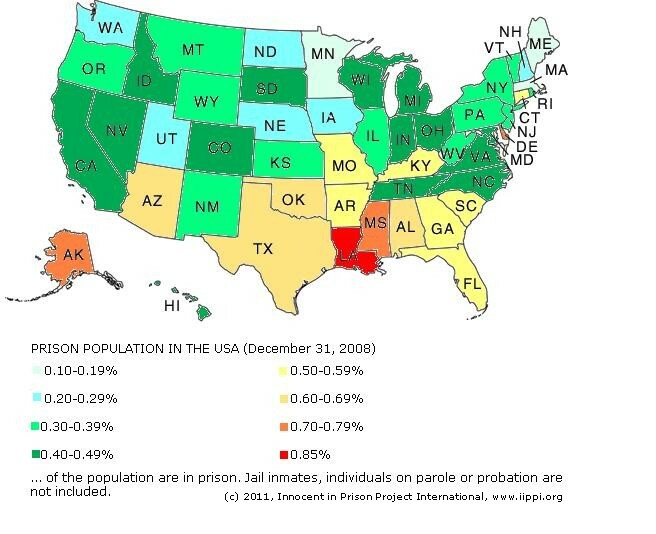 Louisiana alone is the prison “nation” number one. When one compares the U.S. states with each other, and the USA with other countries (the poor and the rich), one realizes that the incarceration rate is not only the consequence of crime, politics and the lack of equalization of wealth, but it is also a matter of culture. The social focus in the USA is the South, once known for plantations and slavery. Nowadays, it is still the “Bible belt” that clings to the death penalty. Its “correctional” facilities on large grounds and the often brown and black people in prison clothes working the fields remind of old times. Especially in rural areas where jobs are rare, each employee at local jails or the Department of Corrections, their families and friends enhance the lobby of the prison industry. They need convicted people to make a living and they cannot have an interest in a decrease of the prison population. Better basic education in the country and more alternative jobs would improve the chance for innocent prisoners to be heard and listened to by voters, and thus, by politicians as judges, district attorneys, sheriffs, legislators and governors. The Innocent in Prison Project International (IIPPI) compiled information from the U.S. Census 2010, the Bureau of Justice Statistics, and the International Centre for Prison Studies. Today, on July 10, 2011, IIPPI provides and illustrates the data in graphics. Read on at http://www.iippi.org/pdf/population_poverty_prisoners_usa2011_statistics.pdf .